1: ARP Attack! (1:38) Rating: 2 Record date: 02/25/2001 AAD by David Ladd Copyright © 2001 The Sheep Fiends Foundation. 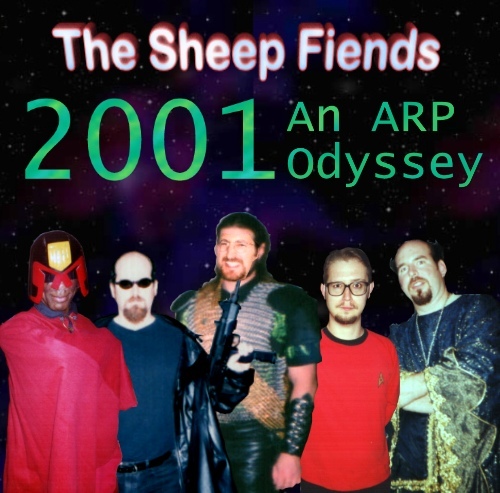 3: Landing Party (7:06) Rating: 2 Record date: 02/25/2001 AAD by David Ladd Copyright © 2001 The Sheep Fiends Foundation. 4: Bird Of Prey (3:11) Rating: 2 Record date: 02/25/2001 AAD by David Ladd Copyright © 2001 The Sheep Fiends Foundation. 7: Galileo Seven (2:31) Rating: 1 Record date: 02/25/2001 AAD by David Ladd Copyright © 2001 The Sheep Fiends Foundation. 8: Maracanroll (3:58) Rating: 2 Lyrics by: Doug Hurst Record date: 02/25/2001 AAD by David Ladd Copyright © 2001 The Sheep Fiends Foundation. 9: Revenge Of The Battlebots (5:26) Rating: 2 Record date: 02/25/2001 AAD by David Ladd Copyright © 2001 The Sheep Fiends Foundation. 10: General Order Four (6:20) Rating: 2 Lyrics by: Matthew Cramer Record date: 02/25/2001 AAD by David Ladd Copyright © 2001 The Sheep Fiends Foundation. 14: Strange New Worlds (6:34) Rating: 2 Record date: 02/25/2001 AAD by David Ladd Copyright © 2001 The Sheep Fiends Foundation.